Qassim Haddad was born in Bahrain. He did not complete his secondary education and is largely self-educated. Haddad rose to fame both as a poet and as a revolutionary, and his poetry often deals with political subjects such as freedom and progress. His first collection, Good Omen, was published in 1970, and to date he has published more than sixteen books in Beirut, London, Bahrain, Morocco, and Kuwait, including Qassim’s Grave (1997) and Walking Guarded with Ibexes (1986). He authored Majnun Laila, a book of poetry and paintings, and Azzawi and Blue Impossible, two volumes of poetry with photographs taken by the late Saudi photographer Saleh al-Azzaz. 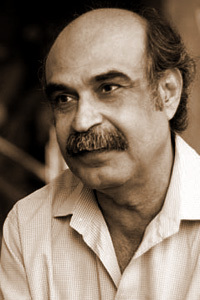 Haddad is the chairman and co-founder of the Bahraini Writers’ Union.